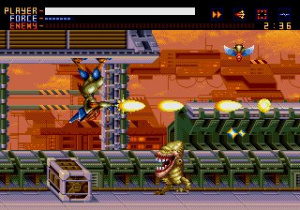 Treasure produced some of the finest games for the Sega Megadrive such as Gunstar Heroes and Dynamite Headdy, both of which are available on the Virtual Console. 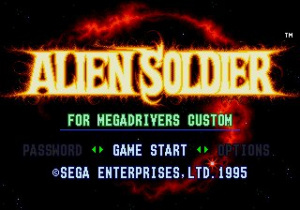 Alien Soldier follows in that great Treasure tradition by being a great game that shows off what Sega’s 16 bit wonder was capable of. Outside Japan this game only came out in PAL regions – a misfortune for North America. The storyline is the usual aliens are taking over the world guff. As this is a run n’ gun game in the mould of Contra, it is hardly important. You’ve just got to shoot everything that moves and stay alive! To aid you in your quest you can pick from six different types of weapons including a flamethrower, laser and homing gun. You can take four of these different weapons or multiples of the same weapon to switch between in the heat of battle. Ammo can be picked up along the way which will fill the gun currently in action. The central protagonist Epsilon is a nimble little fellow. He can perform a hover jump by jumping again while in mid jump. Pressing down and jump will allow you to teleport and with full health you can turn into a fireball and cause destruction to whatever gets in your path. The stages are broken up into short sections where you take out all the little nasties to collect the power needed to beat the big bosses. Unlike most games of this ilk, which save the big boss until the end of the stage, Alien Soldier will throw a boss your way every few minutes, usually 3 or 4 per stage. 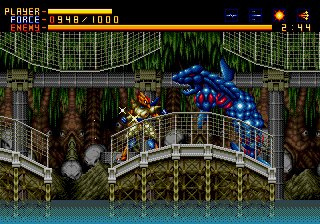 The graphics, and in particular the animation, are some of the best you will see on the Megadrive. All the characters are rich in detail and some of the bosses are huge. The music is excellent and there are speech effects thrown in from time to time as well. The on-screen action is sometimes hectic and yet there isn't even the slightest trace of slowdown. The action is fast and furious, so if that sounds like your bag then this could be the game for you. Given the similarities to Treasure’s own Gunstar Heroes, however, Alien Soldier sort of falls short, mainly because the platforming elements are not as good. It is also frustratingly difficult at times as well, which may put off some gamers. 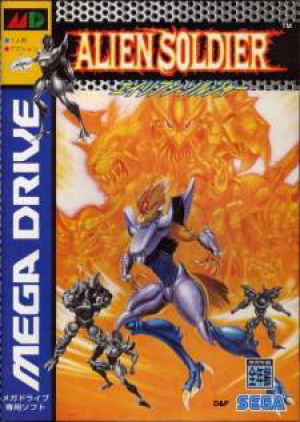 Still, this is an enjoyable run n’ gun game in its own right and well worth a look for fans of the genre.